* Iron Cast Privacy Promise: Come Alive will never share your details with any other party for any reason unless required to do so by law. All of which present you with a way out of your personal crisis! If you’re a successful executive or business owner who is right now facing some kind of personal crisis, what I’m about to share could provide you with the specific keys you need to completely turn things around. No matter what your age, you can suddenly find yourself facing a period of significant, internal conflict that may have you practically frozen with uncertainty – or firing off in all kinds of random directions in a desperate attempt to live again. Now, it could be that some really challenging life event has knocked you back – even knocked you down; redundancy, bereavement, some significant health challenges, a failed business or the loss of someone or something really important to you. Such events can cause us to take stock of our place in the world; our abilities, our value, our role or mission in this life. But it’s not always triggered by a major event. For you, it might simply be that the crazy pace of life has had you rushing from one ‘must do’ to another, fulfilling everyone else’s demands and never actually having a moment to actually identify… let alone SATISFY… your own, personal needs; never allowed you to really define what it is you TRULY want in life. Can a life like that be fulfilling? I don’t think so. And maybe you’re realising that now. It would be like living at the top of a high-rise apartment, whose foundations were never adequately designed and constructed. Then 30-40 years later the whole building is showing signs of worrying instability. Thankfully, in your case, we don’t need to resort to demolition! Instead we simply need to reassess some of the fundamental issues that have never been adequately addressed – and now have you stuck where you are. So how do people traditionally try to cope with a Life Crisis? - Splash out on a red sports car? Or maybe a Harley Davidson. - Ditch your old relationship and get a young girlfriend or boyfriend? - Maybe make a real statement with a bunch of wild tattoos? You see, you can’t pour a ton of PLEASURE into a HOLE that demands PURPOSE and expects things to get better – any more than you can satisfy a need for OXYGEN by eating more food. So, can we get real for a moment? If you don’t get this sorted. How, exactly, will your life turn out? Surveys have indicated that a classic midlife crisis for women often lasts 2-3 years. With men they say it can be 3 to 10 years! Can you imagine 3-10 years of your life spent unproductively, achieving nothing worth mentioning, going around in endless circles without purpose or direction? You’re not getting younger, you know – it’s time to find a way out. 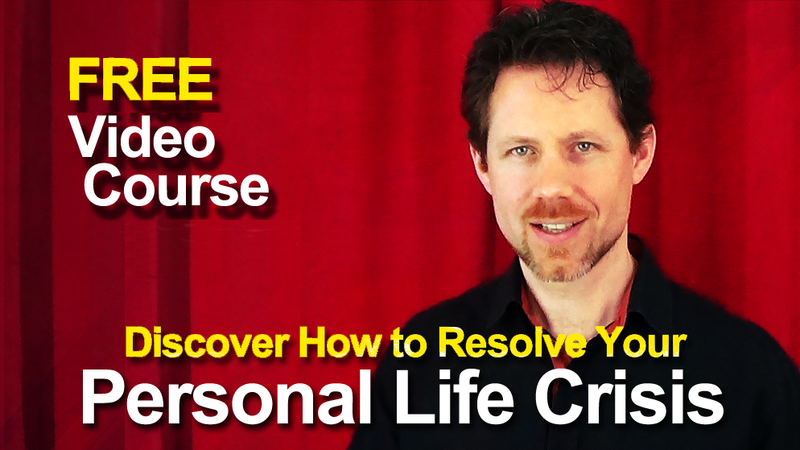 It’s a gift you can give yourself now - by signing up for this free video series that will lay bare the seven vital issues that you must grasp if you are to find your own unique path to your own personal success and fulfillment in life. · and helping you integrate essential principles that will guide you daily and provide you a deep sense of purpose and an ongoing sense of fulfillment. Truth is, these principles are essential for EVERY life – EVERYONE could benefit from getting back to these fundamental issues… it’s just they don’t know it yet. So, I guess you're ahead of the curve here because you've started looking for answers by being here. But this WON’T benefit anyone who has just a passing interest –so if you’re actually OK with things staying as they are, please pass on this and give up your seat for someone else. This is only those committed to seeing things change – for whom it is critical they resolve these issues for good. These videos will give you UNCOMMON ADVICE: new ways of looking at your situation that you will (almost certainly) never have heard before. I will teach, guide, and encourage, yes… but knowledge is NOT the whole answer. I also set things up so you actually TAKE ACTION - The rubber has to hit the road if you want to move forward. But hold on… who am I? I’m Pad. I’m an author, speaker and success coach to business owners and company directors. My work in this area is recognised not only by those who have experienced my coaching first hand, but also by experts, Doctors, therapists and counselors whom I've not only worked with, but have also trained – showing them how to pinpoint specific issues much faster than many traditional techniques have allowed them to do AND then how to follow up with methods that bring about very real, very significant shifts in peoples’ lives. You will find these lessons are taught clearly, powerfully, and in an entertaining way – presenting you with powerful insights that can be immediately applied to improve your situation. That said, most people still seem to assume that learning is the result of good teaching. But it really isn't. The attitude of the student is of immense importance. And if it’s important, like VITAL, that you get a solution to your situation, then you’ll sign-up, turn up, listen up and take action. Clarity comes from experience. I’ll be giving you good seed to sow, but only by YOU sowing the seed into your situation will you discover the true learning. Final thing, the word Crisis comes from the Greek word that means DECISION. You have been presented with a moment that demands a Decision. So, *IF* you’re ready to come with an attitude of … determined to get everything you can from these lessons, and to ACT on what you hear, then SIGN UP NOW, for free and I can promise you significant, positive shifts in your results + your level of fulfillment. The Team Me approach uses the power of 'archetypes' to provides an assessment of the individual's core character strengths and how these relate to the demands of their professional role. A simple profiling tool makes the system highly accessible, enabling anyone to immediately understand why things are working - or not working - in their lives. Visit the TeamMe.com website for more information, free downloads, videos and all the latest news.